Weezy is just a little angel to us. She loves to cuddle with our cat Frodo for an afternoon nap and lounges on the couch with her new sister Bella! She likes to be where ever we are and when we sit down, she and Bella take turns laying on our laps. Weezy’s favorite time is bedtime when she snuggles in the pillows. 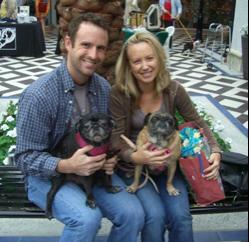 We are so blessed to have her in our lives and thankful to Compassionate Pug Rescue for finding our new girl! We are glad to adopt our senior girl and give her the forever home she deserves! We find that senior pugs are so grateful for everything you share with them and the love that they return to you is tenfold!